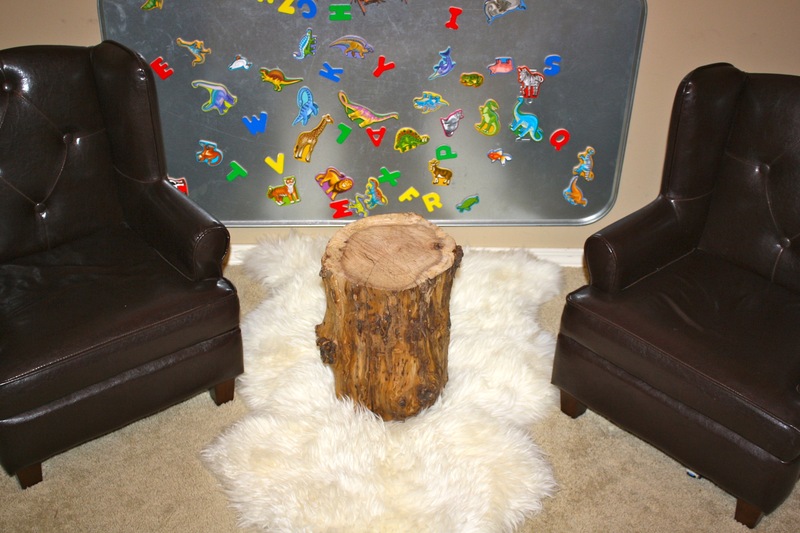 Not Your Typical Playroom Decor | mrs. and the misc. 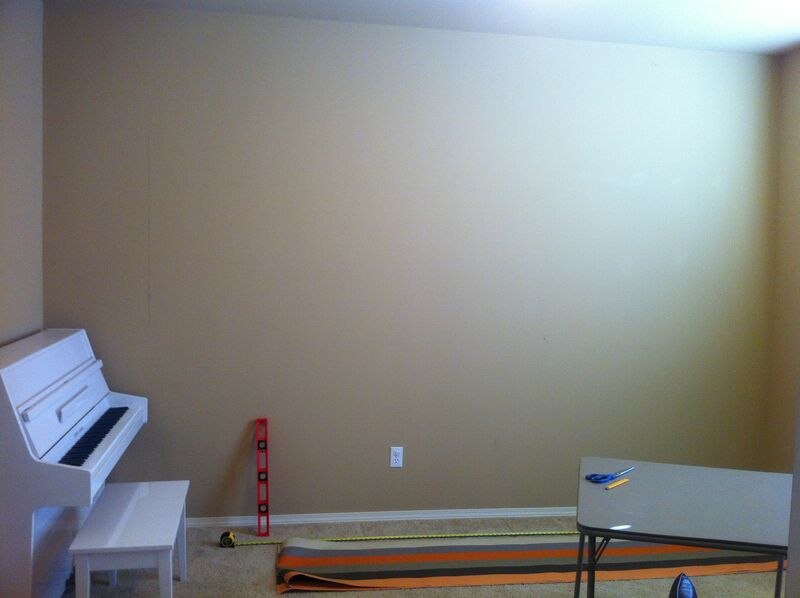 The piano was moved and a sweet local lady came to hang the wallpaper. 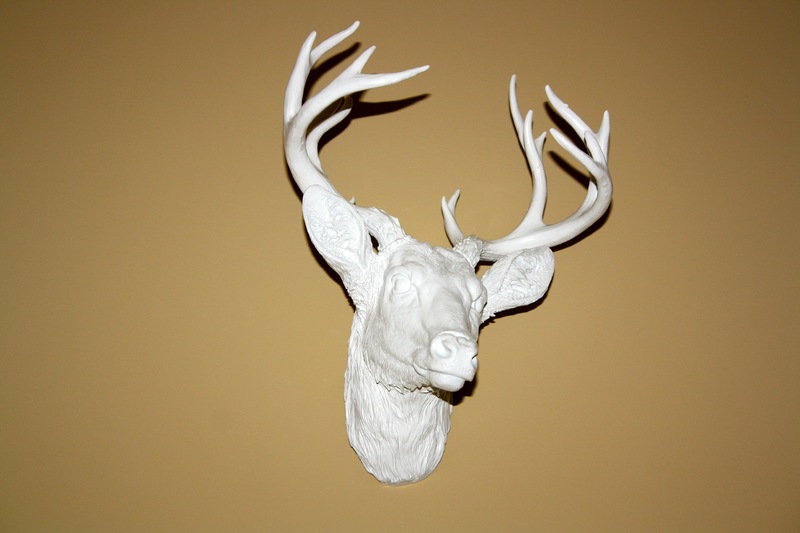 We found this unique antler chandelier at Home Depot online. 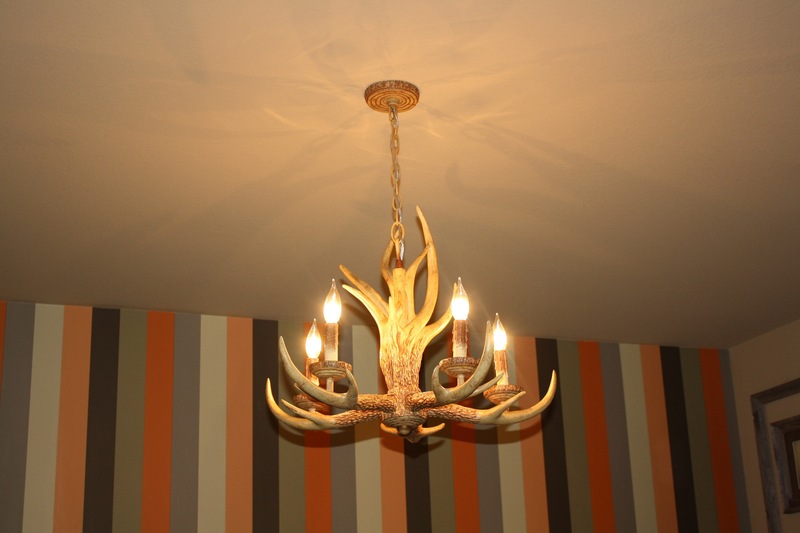 I was surprised at myself that I actually wanted an antler light fixture but it made the room complete. 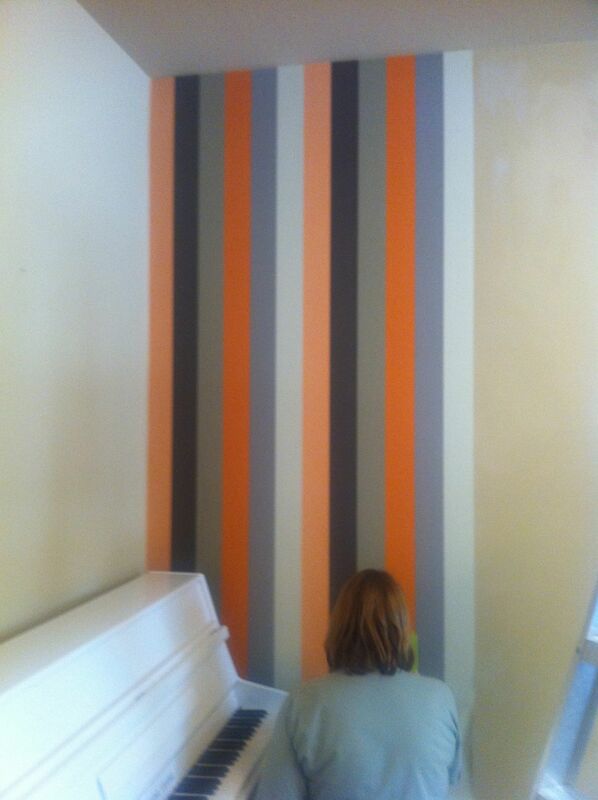 Luckily Shane, my husband was on board with this idea! Nothing say’s “lodge” like antlers hanging from the ceiling LOL. 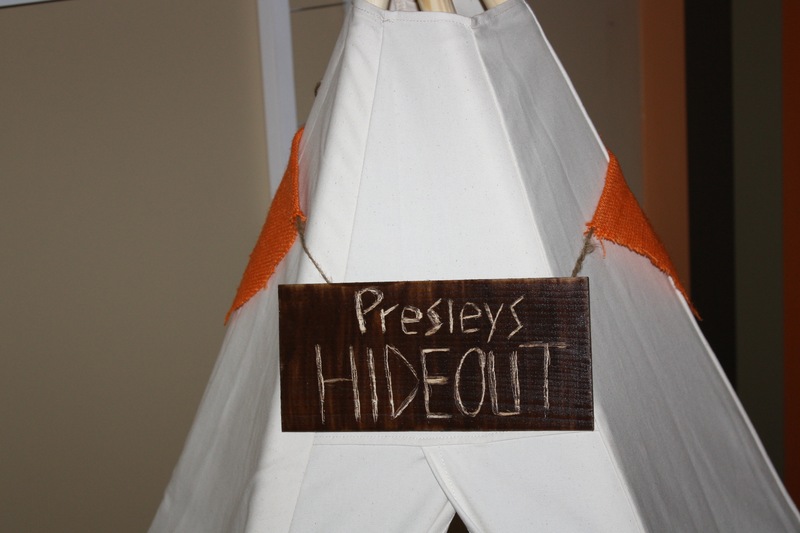 I made a cute flag garland for the top of the teepee in orange and brown burlap. I just cut out triangles of each color and hot glued them to rope. Super easy and affordable! I got some free scrap wood at Lowe’s, wood stain and a wood carver to carve out “Presley’s Hideout”! I stained the wood first and then carved the name out! Only $3, just paid for the stain! What I love most about the teepee is that when P is a little older he can paint or draw on the canvas! 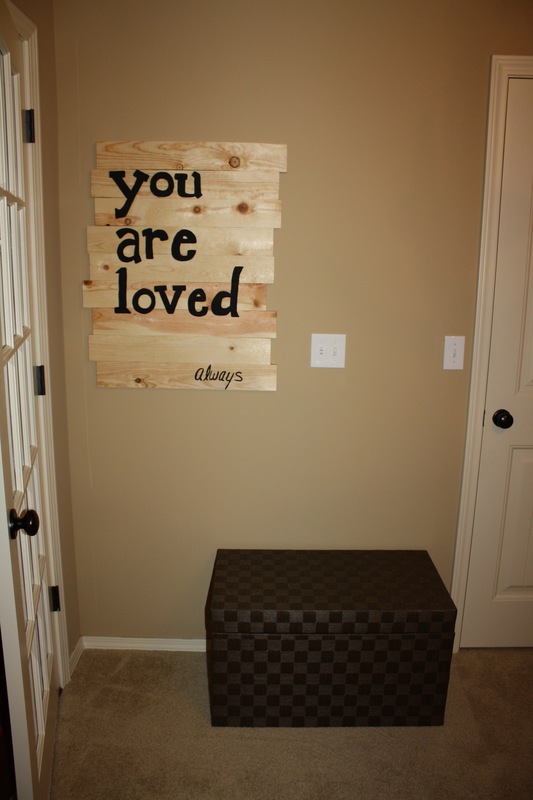 I made the sign below with another piece of scrap wood from Lowe’s and used rope for the letters and border. 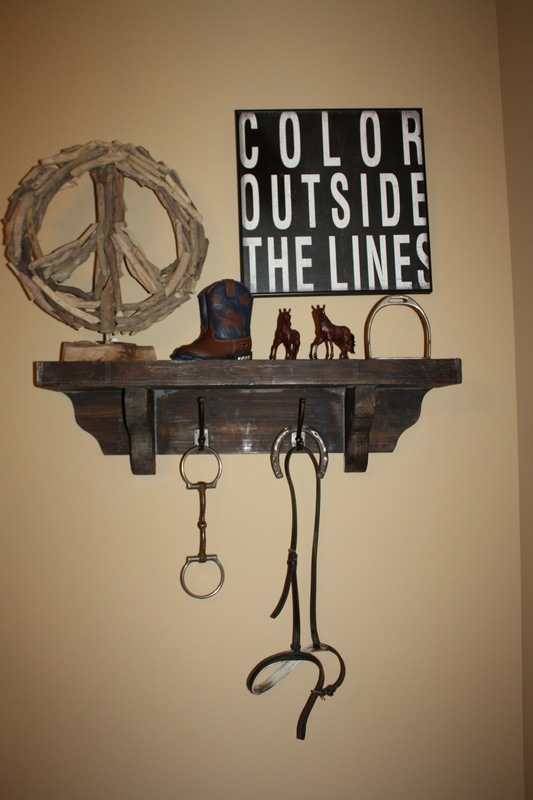 I think it’s fun to display things Presley makes! If you haven’t caught on yet, next time you’re at Lowe’s and need wood, ask if they have any scraps left over first! Most of the time they will also cut the scraps for free. Lumber yards are a great way to find unique pieces of wood. I found a great free stump locally! I took all of the bark off the outside to give it the natural wood look. I love how it turned out! One of my other favorite parts of the room are the cute wing back chairs. They definitely help bring the lodge look into the room. I used an oil drip pan to display all of Presley’s magnets. He loves playing with all the different animals and letters. You can find the drip pans at Walmart in the automotive section and the magnets HERE. 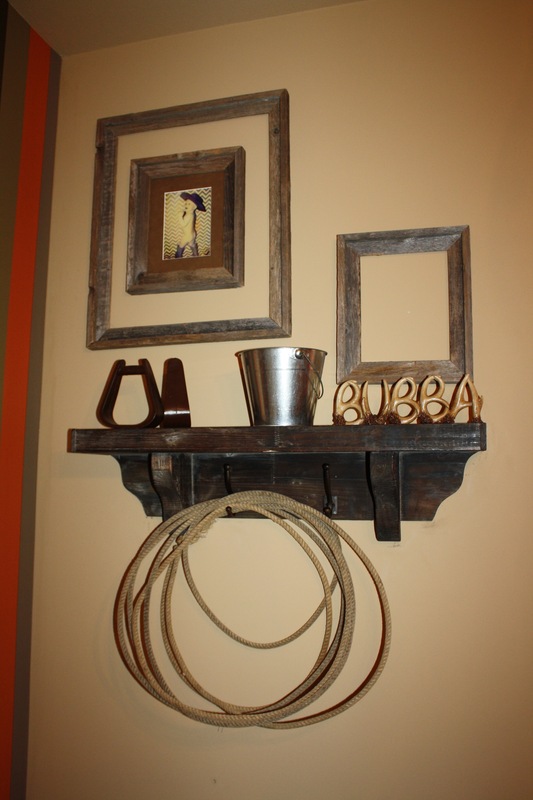 I found these cute wood frames at Hobby Lobby and used some other cowboy décor I already had on hand. The wooden shelves are from Homegoods, one of my favorite stores. I absolutely LOVE the sign that say’s COLOR OUTSIDE THE LINES. It’s a short phrase but has a huge meaning. If you’re a mom like me, you want your kids to explore, never be afraid to be them selves and just have fun. There’s Sandy! She really only costs a nickel and still runs like a charm 🙂 She’s been mine since I was in 1st grade and now I’ve handed her down to Presley! I’ll leave you with one of my new favorite quotes that pretty much sums up what being a mom means to me. 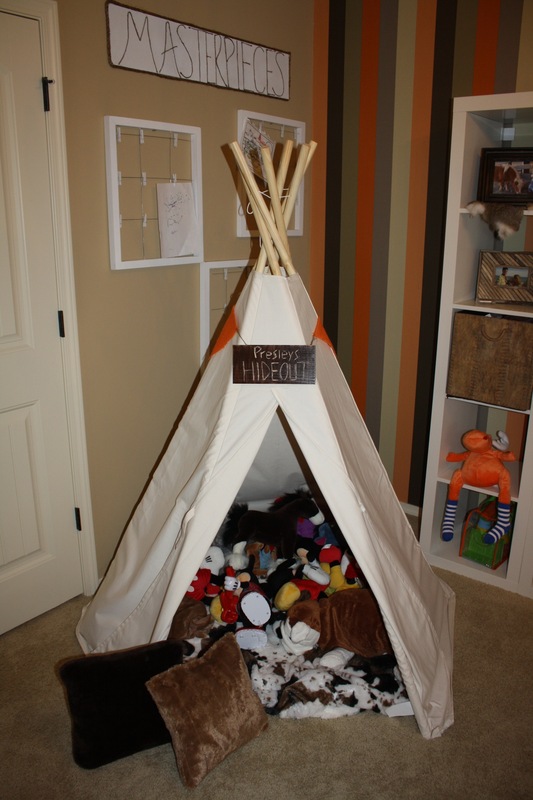 Posted in children, diy, home decor, misc., mrs. robertson	| Tagged antlers, babies, boy, children, cowboy, decor, diy, family, furniture, game room, home, home decor, horse, house, imagination, kids, lodge, mom, mommy, mrs. robertson, pinterest, playroom, rustic decor, teepee, the mrs. I love this!! U r so creative! I so am not! I would so love if you did post all of your creative ideas each week or just whenever! 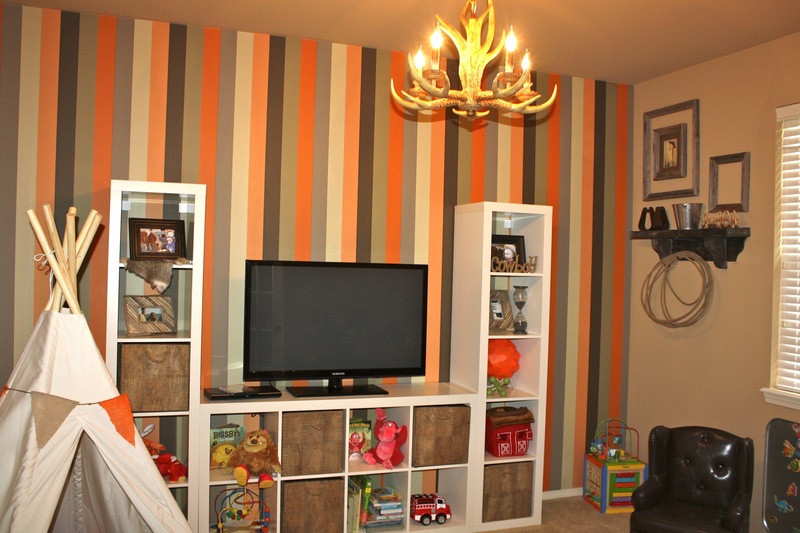 This decor isn’t particularly right for my daughter, but I love all of it and your creativity. My question is the white frames, do they have wire in them? With clips? I didn’t know? Can you explain those? Also did you make the peace sign? I mean I think you should do this for a living or at least on the side! It looks do great. I’m sooo jealous of ur creativity. Well done. So well done. 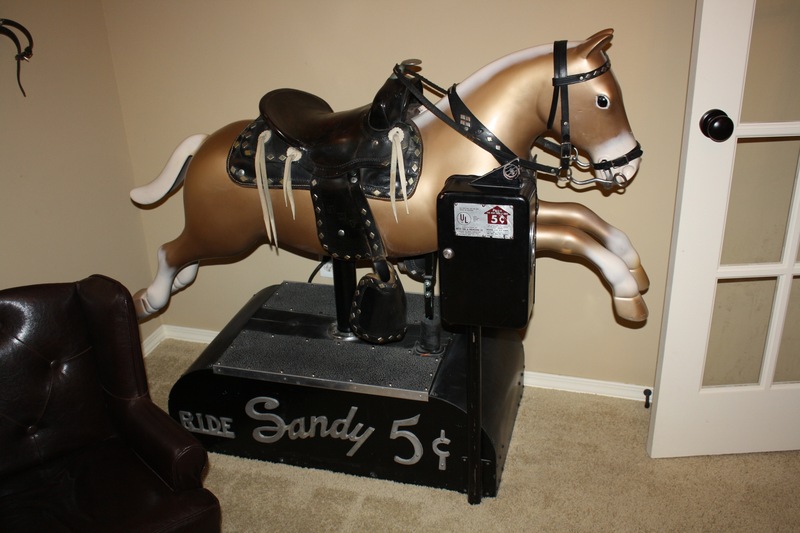 And the horse, I mean, what an heirloom! It completes it, perfect! Thank you so much Ashely! I actually bought my white frames but there is just wire (that you can find at hobby lobby) and small clothesline pins clipped to each wire. 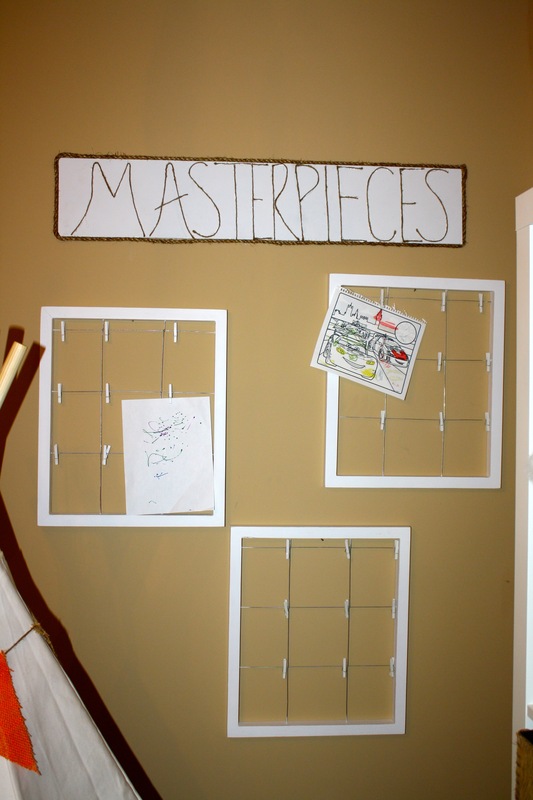 You could do this with any frames you have! 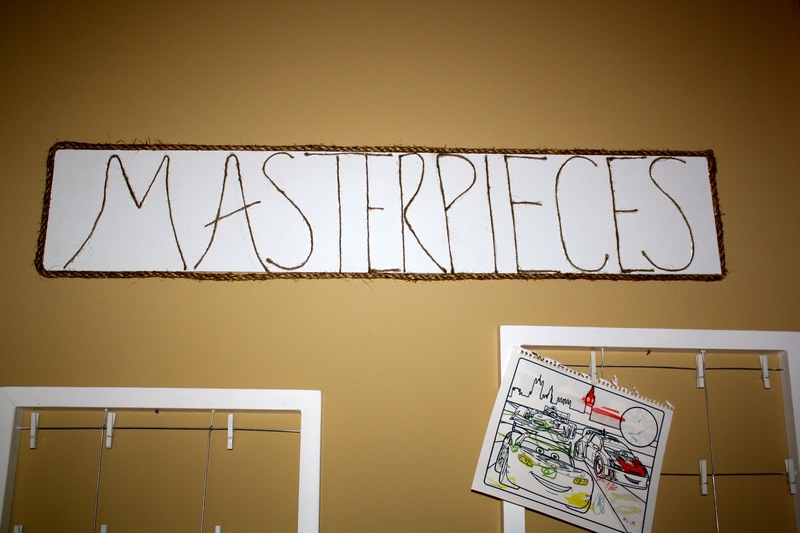 The easiest way to get the look is to use a staple gun and just attach the wire to the inside of your frames that way. After that just attached the clips. I didn’t make the peace sign, I got it at Homegoods. It could EASILY be made though. It’s just tree branches, that’s it! You could snap tree branches into small pieces and then just glue them together (with hot glue or a gorilla type glue). Even if you don’t think you’re very creative, most things look really hard to make, but can be done pretty easily! Let me know if you end up making one of them! I’m glad you enjoy the blog!!! Thank you!!!!! 🙂 I had fun decorating it!